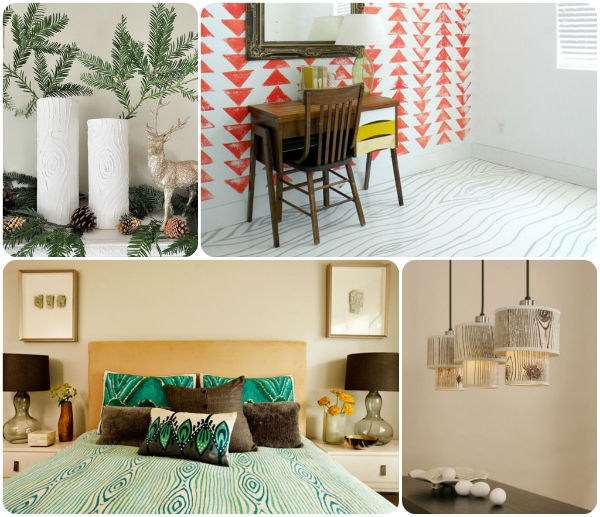 As the year comes to an end I wanted to take a look back at a few of this years hottest, trendiest patterns that I loved the most, along with some ideas on how we all incorporated them into our homes! This isn't your Grandmothers flower print with washed out pinks and yellows. We're seeing bright oranges, reds, deep grays and kelly green. Although still soft and beautiful, the modern floral print is full of shape, movement and the perfect choice in pattern for adding lots of personality and a splash of color into your space. If you're into more clean-line graphic patterns, then this one was for you. The Greek key design is a decorative border and sometimes allover pattern constructed from a continuous line, shaped into a repeated motif. It definitely follows more of a preppy or modern look but used in the right color it can lend itself well to a contemporary style too. Faux bois (or false wood) refers to the artistic imitation of wood or wood grains in various repeating free formed shapes. I LOVED this trendy pattern in home decor this year because it can bring in a natural/earthy element and add a lot of texture to your space. Faux bois in a natural tone, is the perfect compromise to a boring, solid color. We saw a lot of variations of a new technique for patterns called Ikat. Basically it is a dyeing technique used to pattern textiles that employs a resist dyeing process similar to tie-dye, so the finished product almost looks smudged or like it's bled a bit from the natural line. The greatest thing about this new trend is that it was more of a technique than pattern. It can be used on all sorts of different styles and fabrics, from floral's to graphics, so finding an Ikat treated fabric that works for your individual style is fairly easy. Usually seen in black and white and originating from Scotland, houndstooth is a duotone textile pattern characterized by broken checks or abstract four-pointed shapes. Used on both larger and smaller scales, this pattern has a more traditional feel, although in the past year we've seen it really come to life! 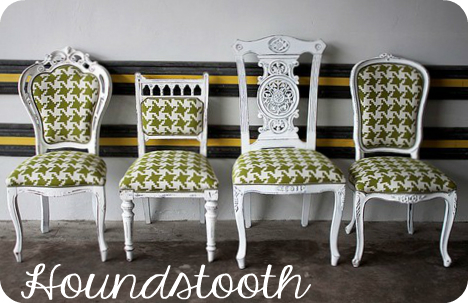 From upholstered chairs to wallpaper, this repetitious pattern is a two-tone beauty. Because this design is directional it creates a feeling of movement and can give the illusion of a space being larger than it really is. Were any of these trendy patterns too 'out there' for you this year? Or did some of them make their way into your home? And in your opinion, what do you think 2013 will bring? Yummy eye candy! I love incorporating a few fun patterns with my neutrals. Great post! 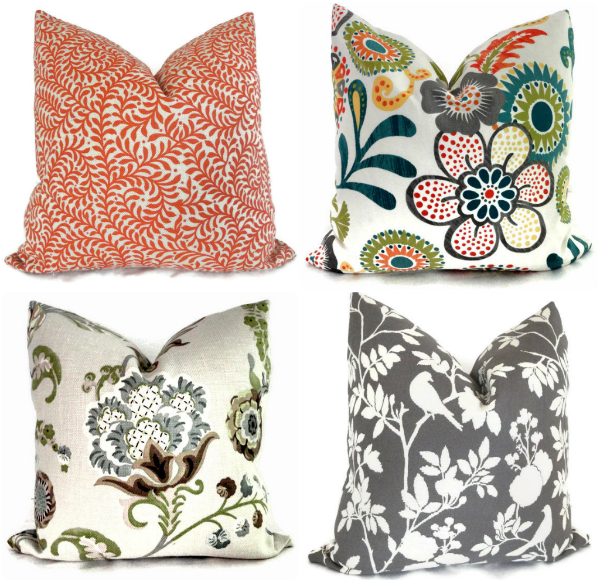 I'm thinking I'll add some modern floral in pillows, etc. in my living room here soon. I also think herringbone and hexagon will continue into 2013. 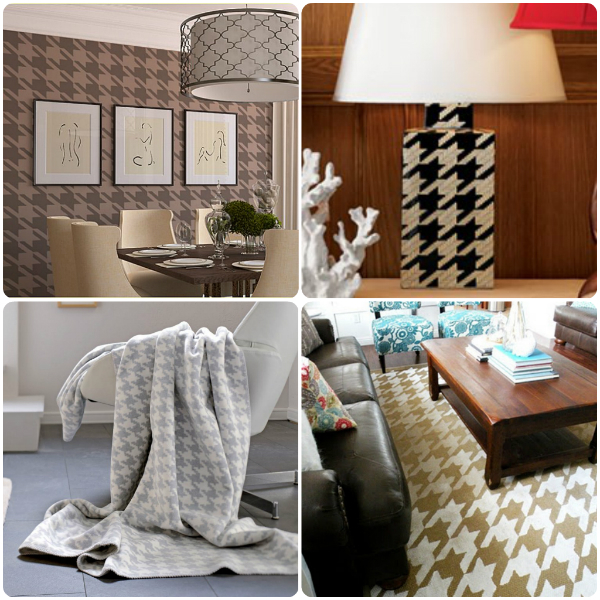 You know, I love the look of houndstooth...except we live in the South and my husband is a die hard LSU Tiger fan. Their rivals, the Alabama Crimson Tide has appropriated houndstooth as their official pattern. Therefore, I am not "allowed" to like it. Horrible, right?! Football is so SERIOUS. I love all those patterns, but I'm wondering if you have a sense of how long they usually last before they're seen as outdated. I've been hesitant to use these patterns in anything other than a pillow so that I don't have to invest in reupholstering or buying a new rug in the near future. 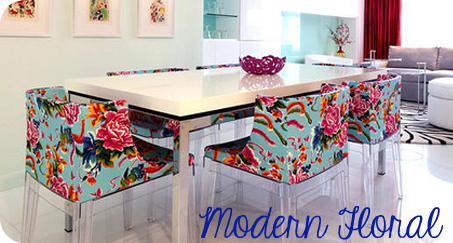 Modern floral is by far my favorite! Is that a picture of your diningroom? 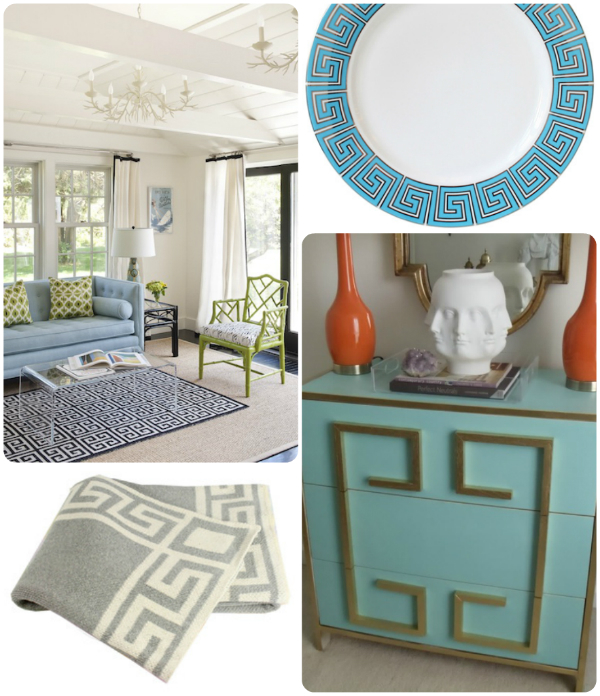 These are such fun patterns & themes! Yay for good trends! 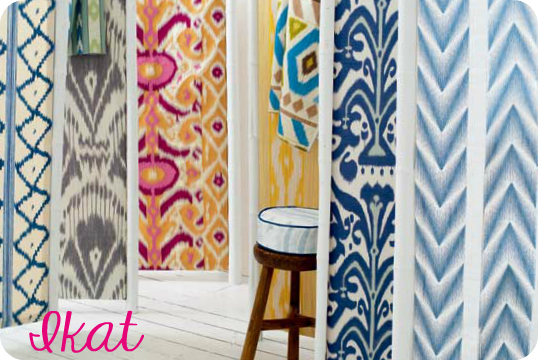 I really liked the ikat prints I saw this year...but never quite enough to actually buy any of them. I am in the market for curtains with some kind of modern pattern for our living room and I can't find one I love enough to drop the cash I will be spending to get what I want...heavyweight for energy efficiency, lined, nicely finished. I have spent years buying "good enough for now" things while we paid off debt, built our savings, had kids...now we are more financially secure and I am finally ready to buy some things that will last and I can't decide!!! 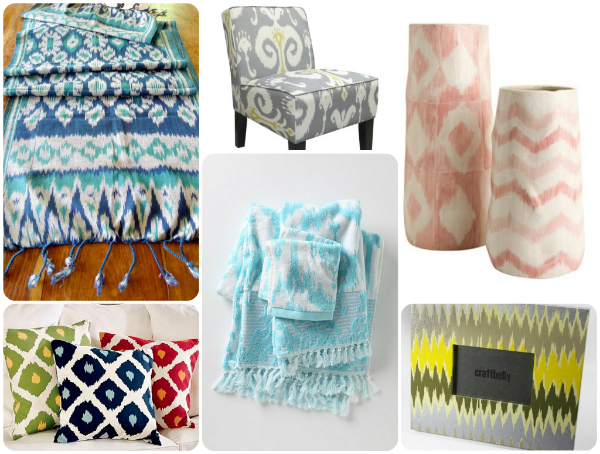 oooh i love ikat print everything. and i've always been a fan of houndstooth too, it's so classic. 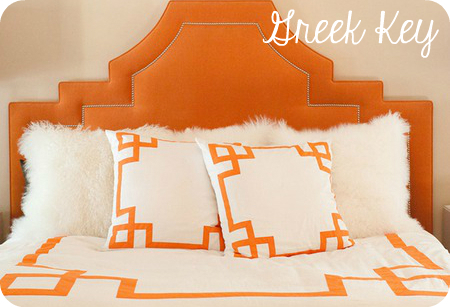 I'm in love with the Greek theme. It gives a peaceful "medieval" feeling in the atmosphere of a room setting. Regarding the houndstooth design, we don't have a furniture that displays this kind of pattern but I have a purse that proudly shows it. I am not a big flowery person....but those chairs....I die!!! OMG beautiful! I've been looking forward to this post! Awesome!! I thought to have new floral pillow cases for my bed room. 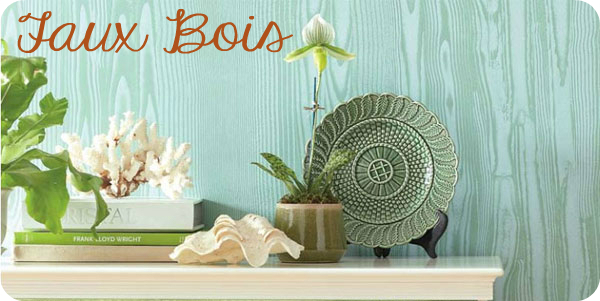 Actually I love “Faux Bois” idea. Thanks for sharing creative things like this. Love the chairs in the first foto! omg they're amazing! the florai print + the invisible legs!